The Tata ancestors were part of a large group of Parsis who left Persia for India in the 8th century. One of the chief centres chosen by them to settle in was Navsari in Gujarat. It was here that the Tata family lived for more than twenty-five generations as priests. The family lived in Mota Falia's Dasturwad, an area generally inhabited by families of the Parsi clergy. The room where Jamsetji was born. As was customary in those days, Jamsetji's mother, Jeevanbai, came to her father, Kavasji Maneckji Tata's house for the birth of her first born. Jamsetji Nusserwanji Tata, the Founder of the Tata group, was born on March 3, 1839, in a single storeyed house in one of the tiny by-lanes in Dasturwad, owned by his maternal grandfather. Kavasji Maneckji Tata, was also the paternal grandfather of R.D. Tata and the great grandfather of J.R.D. Tata. 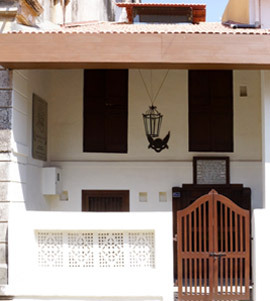 On March 3, 1939, the birth centenary of Jamsetji, this ancestral house was endowed to the J.N. 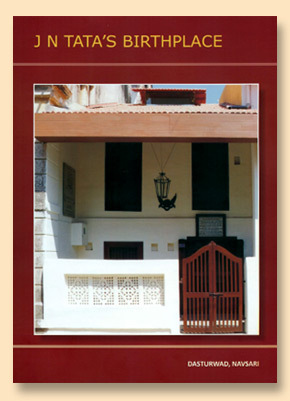 Tata House (Birthplace) Trust by J.R.D Tata. In 2014, to commemorate the 175th birth anniversary of Jamsetji Tata, with the approval of the Trustees of the J.N. 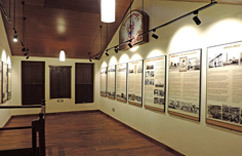 Tata House (Birthplace) Trust, Tata Central Archives, A Division of Tata Services Ltd., restored the Founder's Birthplace with support of Tata Sons Ltd. The restored house was inaugurated on March 3, 2014. Walking in through a low wooden door of this 1,500 sq. ft. single storeyed house, one enters a small sitting area. 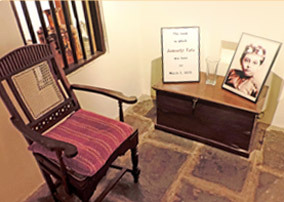 The most special and revered area in the house, is the room where Jamsetji was born. 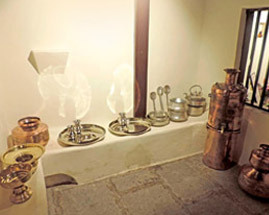 A prayer room with utensils used at that time are also on display. Another room leads to a back door and a small outdoor area. A climb up a flight of steep wooden stairs leads to the upper floor. This could have been the sleeping quarters. 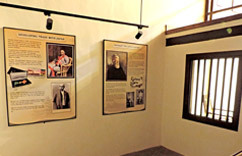 A permanent exhibition, tracing the life of this extraordinary visionary, has been set up at the Birthplace. With over 150 digitally enhanced photographs, this exhibition takes you on a journey portraying Jamsetji's industrial achievements, his personality and character, the clothes he wore, the food he was so fond of, the books he read, and the numerous journeys he undertook during his lifetime. Open to the public, a visit to the house and the exhibition therein, evokes a sense of awe and immense respect for the farsighted leader whose visionary nation-building ideas changed the face of our country. 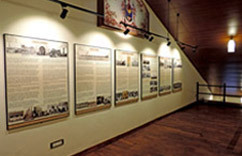 A view of the display panels.